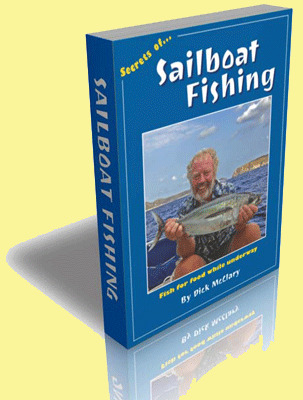 Sailboat fishing is more about food than sport, which is why the following sequence of events kicks-off with a barbecue grill, or more accurately, the lack of one. Just about all the other boats in the anchorage had one, but we didn't. Tantalised by the smoky aromas and happy chortling that drifted across the anchorage I wanted one. Mary didn't, conscious of all those little carcinogens lurking in the charred meat, intent on doing bad things to us. Ergo, no barbie. Now I'm not much of a cook, which is not the best of news for Mary, as she ends up enslaved to the gas cooker below. There's nothing chauvinistic about me, you understand. "Of course if we had a barbie I would cook the fish on it". Big mistake. Before I could retract this casual remark I was whisked off to the chandlery by a suddenly enthusiastic Mary, later emerging $200 poorer and clutching a Magma Grill and a large bag of charcoal. 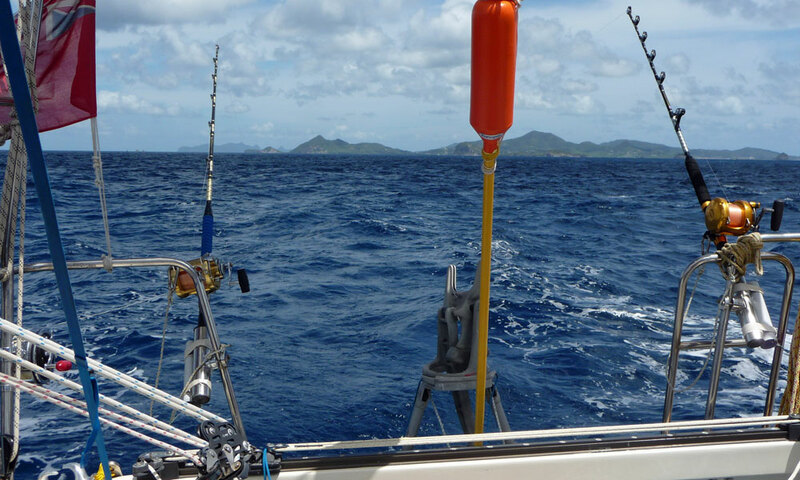 As we departed Admiralty Bay, Bequia, on passage for Union Island with the sailboat fishing gear deployed astern, hopes were high. My thoughts were already on the fresh dorado steaks that would undoubtedly be sizzling on the barbie that evening. Lures astern - let the action begin! But the waters of the Caribbean are clear. Fish can see for miles. The appearance of the shiny new barbecue on Alacazam's quarter-rail had them nodding wisely to each other and giving our spread of trolling lures a wide berth. If fish had fingers, I could guess what the index one would be doing. Mary said I was failing to catch on purpose, just to avoid cooking. On dropping the hook in Chatham Bay, fishless, I was heartened to see loads of fishy activity on the surface. Just as soon as we had Alacazam safely anchored, I was off in the dinghy with a light spinning rod. With tuna creating panic amongst the baitfish wherever I looked, confidence was high. Mistakenly, as it turned out. My surface lure, usually dependable in such situations, was totally ignored. Rumours of the recent purchase had spread far it seemed. Now we hunter-gatherers never give up, so arriving back at Alacazam, fishless and ready to fend off sarky comments, I thought it might be worth trying a spot of jig fishing from the cockpit. Jigging involves raising and lowering a specially designed lure (the jig) close to the seabed. The trick is to lower the jig to the seabed, wind in a turn on the reel, lift the rod tip fairly smartly then lower it, allowing the lure to flutter back down again. Continue this process until a fish grabs the lure or your arm drops off. To give the fish no chance whatsoever I attached a string of Sabiki 'bait catchers' above the small jig lure. And it was one of these that was responsible for our hero's downfall. It worked. Within a few minutes I had a fish - not huge, admittedly. OK then, very small. A threadfin herring, every bit of six inches long. Holding it triumphantly aloft, expectant of praise and adulation, 'her below' pointed out that I would "need to be careful which way I placed it on the grill or it would fall through". They just can't help themselves, can they? And so disrespectful of the little fellow who was destined to play such a heroic role in the forthcoming sailboat fishing events. In the failing light, the prospect of a sundowner took precedence over any further incursion in the threadfin herring population, so the hapless victim was reduced to two fillets and consigned to the fridge. A couple of days later, now anchored off Frigate Rock at the southeast tip of Union Island, I was enjoying a spot of early morning fishing before we weighed anchor to sail on to Carriacou. I’d sliced one of the fillets from our hero - the threadfin herring - in two and was freelining it in the current using the light spinning rod. There had been no takes in the first few minutes, and fancying a brew, I put the rod in the holder, slackened the drag right off and went below to put the kettle on. Back in the cockpit, sipping the steaming cuppa, I lifted the rod gently to add some life to the bait. Damn! Caught on the seabed. My fault for leaving the rod unattended. I tightened the clutch on the reel and was trying to pull it free, when the ‘sea bed’ started to move off, and there was nothing I could do with the light rod and 15lb line to dissuade it from doing so. I had to give line or a break was unavoidable. Soon, whatever it was, was on its way to Carriacou ahead of schedule. But after about twenty minutes or so of recovering line, then having to give it back, I felt I was beginning to win the struggle. Hard work, this sailboat fishing! Later, now close to the boat, the fish really started to enjoy himself. He discovered that by swimming around in circles under the stern he could hook the line around the dinghy’s outboard. By swimming between the dinghy and Alacazam he could involve the painter, and with a little luck the Aries self-steering gear too. Changing from port to starboard meant that the backstay, the dan-buoy and the gantry could get involved, and a surge ahead had me clambering poledancer-like around the outside of the bimini. As soon as we found ourselves on the same side of the boat he’d decide he’d rather be back where he was, so the entire toe-stubbing, arm-wrenching procedure could be repeated. Huge fun. Oh how we laughed! 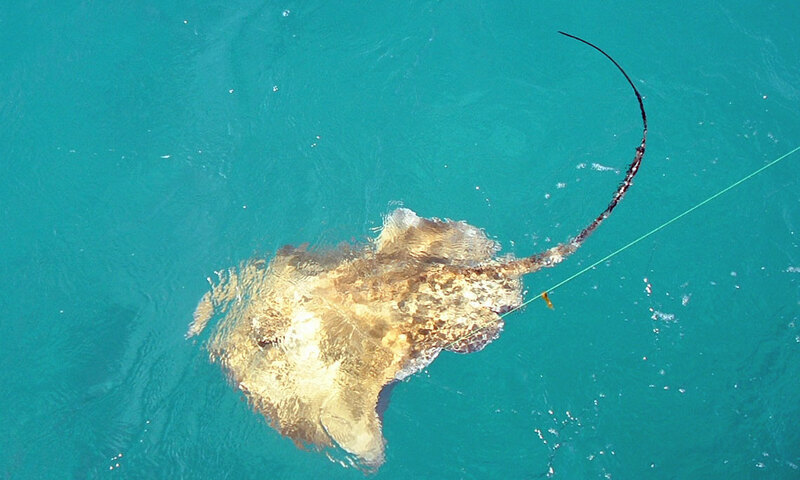 But now I could see what it was - a large sting ray, about five feet (1.5m) from wingtip to wingtip. "Probably a tad too much ‘hangover’ for the barbie", Mary said. Neither of us was keen to get too close to this impressive creature, so when we had it alongside the boat Mary cut the line as close to the fish as she dared. It swam away, none the worse for its exertions, with our apologies ringing in its, er, ears. After explaining ourselves to our bemused neighbours, Murray and Nadine on s/y ‘Squiz!’ who had witnessed the curious antics on Alacazam during the epic battle with the stingray we set sail for Carriacou. I put two trolling rods out, the windward one a 50lb outfit rigged with a deep-diving lure and the leeward one a 30lb outfit rigged with a trolling feather topped off with the other half of the fillet from our hero. 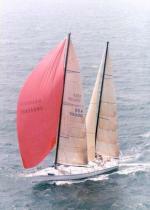 Not being in any great rush we were sailing under a reefed mainsail and yankee only, which gave us around 5knots. Just four miles out, the reel on the leeward rod began to sing, with line pouring off it lickety-split. 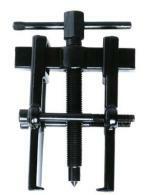 I struck hard to set the hook and tightened the drag as much as I dared, then returned the rod to its holder. This was a good fish and was still taking line; my intervention hadn’t discouraged it in the slightest. ...while I started to get the other lure in. Then the reel stopped singing and the rod straightened up, a clear sign that all was not going to plan. The 150lb mono leader had been cleanly bitten through and the fish was off. A big wahoo, I’ll bet. Damn! I re-deployed the windward outfit and brought in the leeward one. It was while I was re-rigging it that the 50lb outfit started to sing. It’s hard work, this fishing. 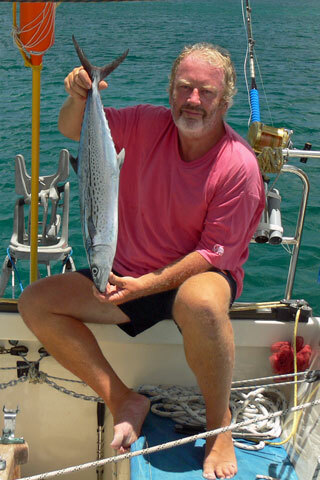 This time my opponent was outgunned and I’d soon netted my catch — a spanish mackerel. From a culinary point of view these rate right up there with dorado and wahoo in my view, and perfect for the christening of the barbie. 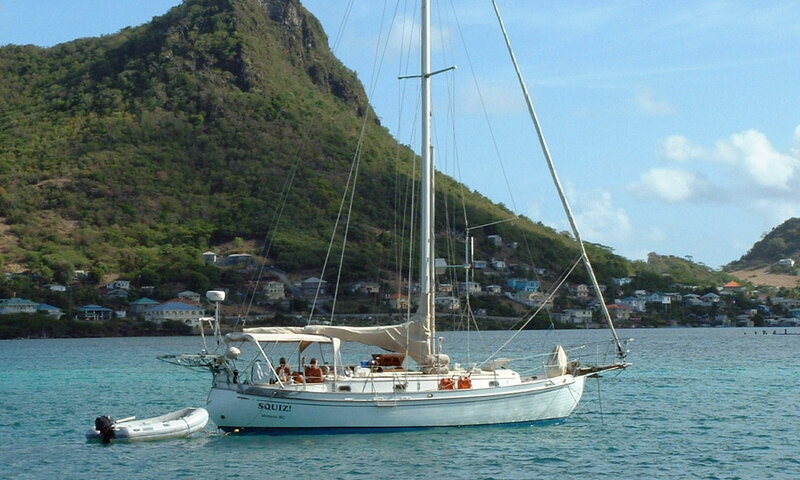 We anchored in Hillsborough Bay, Carriacou and met up again with our Swedish friends Jonas and Ylva on s/y ‘Lena’. Great company with or without barbecued spanish mackerel, which we all agreed provided a very tasty dinner. Next morning we set off for the Tyrell Bay anchorage, just around the headland. Hardly far enough to raise the sails so we put in a leg out to sea, to make a sail of it. And of course I still had the remains of our hero in the fridge. I set up the 30lb outfit with a blue and white tuna feather, adorned with the whole hero fillet. Brown boobies, always a welcome sight, were much in evidence. The presence of these diving birds usually means there are fish around, so I was ready for it to happen. But it didn’t, until I wasn’t. We had passed inside Sisters Rocks, and had turned east to enter the anchorage. I was at the mast dropping the main, and Mary was helming and tidying away the sheets and other assorted string. My next job would have been to bring the trolling gear in, but it chose that moment to burst into action. By the time I got back to the rod the fish must have been 300yds or so astern, and trucking. I set the hook and hung on. In the distance a long, lean fish leaped high into the air. A wahoo? King mackerel? Neither unfortunately. It turned out to be a barracuda, and a big one. Mary had two objectives; to keep the fish astern, and Alacazam off the reefs that border the anchorage, and the shoal that’s in the middle of it. She mentioned what a great help my shouted instructions were. The fish was doing little to help, which I thought was pretty unsporting of it, but my instructions to Mary were again clear and concise, along the lines of “mind-the-rocks-turn-the-engine-on-watch-the-depth-where’s-the-camera-get-the-gaff”. She just doesn’t know how lucky she is. With our main half down and our slalom-like approach to the anchorage, Alacazam was again providing huge entertainment to anyone who cared to watch. Sometimes I wish we hadn't painted her bright yellow. Blue with white flecks might have been better. We gaffed the barracuda and got it aboard. Jonas and Ylva were there to welcome us in, having been one of our audience. “What on earth was all that about?” Jonas said, and something else in Swedish - probably very rude - when he spotted a Great Barracuda taking up most of the cockpit sole. It’s not a fish you’d want to make a pet of, the barracuda. Distinctly uncuddly. Not so much a piscatorial spaniel, more a rottweiler/alligator cross — and this one looked very cross. A slug of Jack Iron rum poured directly into the gills had killed it quickly and humanely before it could carry out any malicious intent. But what to do with five feet of dead barracuda? Many sailboat cruisers won’t eat them, especially large ones, owing to the risk of ciguatera poisoning. Ciguatera is a toxin found in many reef fish, and predators that feed on reef fish. It collects in the fish’s liver, so an old, large fish is more likely to have accumulated a dangerous amount of it than a small, young one. If you’re unlucky enough to eat a fish that has it, then you could be in for a very torrid time. It’s generally accepted that it’s only present in the resident fish populations of the northern part of the Caribbean chain. South of Guadeloupe incidences of ciguatera poisoning are very rare indeed. 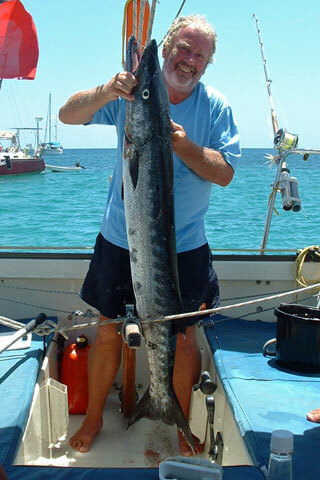 But a fish the size of this barracuda may have traveled far, and could just be down south on holiday. 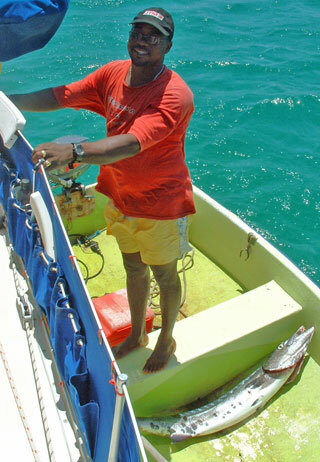 The good people of Carriacou though, having eaten local fish for years, are made of sterner stuff. A quick call on the VHF, picked up ashore by a taxi driver, soon had a grateful islander, Sharwin, alongside to collect the fish. But what of our little hero, the threadfin herring, who although having failed to provide anything for the barbie, went a long way towards it in tempting four good fish, one of which we cut away, one that got away and one we gave away. Well, according to Sharwin, indirectly our hero fed forty people. Nobody died. Well, that’s my tale about four days of sailboat fishing aboard Alacazam.